The demand for information and production of dune and estuary plants to control coastal erosion is strong. Tax dollars and tourism revenues are dependent on a healthy dune and estuary ecosystem. Through education and marketing efforts, municipalities and property owners in North Carolina have been made aware of the role of native plants and their availability from NC farmers. These farmers have recently provided more than 120,000 dune plants for major beach renourishment projects in coastal counties. This project served to support the growing native dune and estuary plant industry through research, education, production trials, and marketing efforts. Sea oats and other dune stabilization plants are needed to build and stabilize coastal dunes in North Carolina. The dunes provide coastal communities with infrastructure and property protection during hurricanes. Also, the dunes are a unique ecosystem that provides habitat for birds and animals while providing natural beauty enjoyed by residents and visitors. Estuaries are another important feature of the North Carolina coast. Native species are needed for erosion control and to provide buffers to protect water quality. Developing a coastal plant industry in the state is needed to supply estuary and dune species to coastal communities and property owners. North Carolina farmers have been introduced to opportunities associated with commercial production of dune and wetland species. Research, education, production trials, and marketing efforts continue to be needed to support this growing industry. 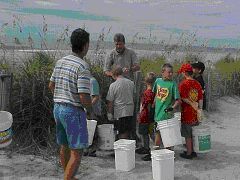 Research was conducted on both dune and estuary plants in 2003. 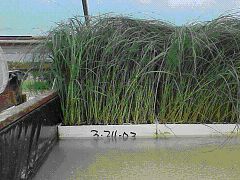 Sea oat plots were established at the Castle Hayne Research Station, and clones from the Wrightsville Beach plots were taken to North Carolina State University for further examination. Both NC State and Louisiana State University scientists are participating in this work. 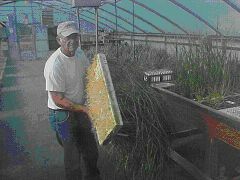 Dune and estuary plant production research was conducted at the Oak Island greenhouse to develop and improve production methods. Educational efforts reached coastal property owners, elected officials, government employees and youth about the importance of dune and estuary plants for stabilization and erosion control. Farmers learned production techniques and species information. Production trials with the Town of Oak Island and a Brunswick County grower resulted in improved fertility management, better control of diseases and comparisons of growing media. 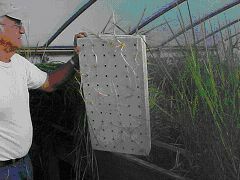 Both demonstration and replicated trials were conducted to learn BMP’s for dune and estuary plant production. Production of the threatened species, Amaranthus pumilus, was improved at Oak Island, and plants were grown for the USF&W in Charleston, SC to reestablish this species along the SC coast. Seabeach Amaranth plants were also grown for NC State Botany Department research on Bird Island, NC. Marketing efforts focused on educating coastal municipalities and residents about the plants needed to stabilize dunes and control erosion. The need for native, indigenous species was emphasized, and contact information for NC growers was provided. The Dune & Estuary Plant Production Project positively impacted coastal municipalities, coastal property owners, youth, farmers, and coastal advocate groups. 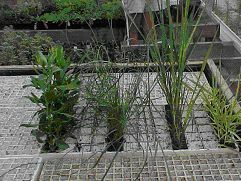 New research on estuary plant species resulted in float system production of Spartina alterniflora, Spartina cynosuroides, Spartina patens, and Borrichia frutescens. Approximately 1000 plants were grown at the Oak Island greenhouse and planted along the Atlantic Intracoastal Waterway to combat erosion. 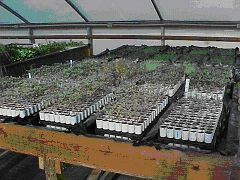 The value of the plants was estimated at $700. This research has resulted in interest by local farmers who intend to commercially produce these plants in 2004. Research, education, and greenhouse trials at Oak Island continue to yield positive results to conserve and protect North Carolina’s coast. The Town of Oak Island saved approximately $250,000 in 2003 by growing sea oats, bitter panicum, seashore elder, and other dune species to build and stabilize coastal dunes. In Brunswick County, 67% of the property tax base is generated by coastal communities. Protection of this infrastructure by developing and maintaining a healthy dune ecosystem is critical to the welfare of the county and local municipalities. Dune plant production plays a key role in conservation of the dune ecosystem. North Carolina farmers provided more than 120,000 dune plants for two major beach renourishment projects in Brunswick and Carteret Counties. The information learned at Oak Island was transferred to farmers growing sea oats, bitter panicum and other dune species at the first ever Dune Plant Production meeting held at the N.C. Cooperative Extension, New Hanover County Center. Evaluations from the meeting were very positive, and farmers indicated the continual need for this type of Extension program. The role of education for coastal residents and municipalities cannot be over-emphasized. Through Extension programs, workshops, presentations, and meetings, more than 600 individuals learned about the role native plant species play in coastal ecosystem conservation and protection. The impacts of hurricane Isabel resulted in major damage to the dune ecosystem in Dare County. North Carolina dune plant growers are benefiting from the demand for plants to restore the dune system. More than a million dune plants will be needed to restore the dune ecosystem there, and most specifications require the use of indigenous NC plant material. This specification for NC plant material is a direct result of the work from this project. Tourism is expected to soon become the number one industry in North Carolina, and the coast is the number one tourist destination. Conserving and protection this environment through research, education, and marketing of dune and estuary species is vital to state, county, and local economies. Extension Agent participation in monthly Brunswick Beaches Consortium meetings to supply coastal management information to representatives of the six coastal communities in Brunswick County. Presentation on Coastal Dunes at the Wilmington Garden Show where 40 individuals learned to use plants to build and stabilize coastal dunes. Eighty individuals representing municipalities throughout coastal North Carolina attended the 2003 Coastal Municipalities Conference and learned the importance of using locally grown native, indigenous species to conserve and protect the coastal ecosystem. More than eighty students and teachers learned the importance of the dune ecosystem and how to conserve and protect this resource through the use of native plants. Forty members of the Oak Island Beach Preservation Society learned about dune plant production and establishment to protect the dune ecosystem. Thirty-eight coastal residents and municipal employees in Carteret County learned to build and stabilize dunes using vegetation. The Dune Book, a new NC Sea Grant publication, was co-authored by this agent. The book has been well received and in demand by coastal communities and residents. Residents and elected officials from Topsail Beach participated in a two-day dune management workshop and learned to choose and plant correct species to build and stabilize their dunes. Two programs for the Wrightsville Beach Town Council provided the information they wanted to protect and conserve their coastal dune system. More than one hundred attendees at the annual meeting of the American Shore & Beach Preservation Association learned the importance of using native, indigenous vegetation to conserve and protect coastal dunes. Twelve farmers attended the first Dune Plant Production Meeting in August 2003 and learned improved production methods and species information for both dune and estuary plants. 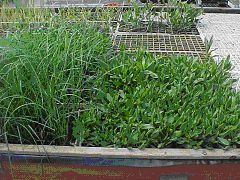 Attendees at the NC Greenhouse Vegetable Growers’ Association Annual Meeting learned about dune and estuary plant production using the float system. Fourteen cub scout youth and adult leaders participated in harvesting sea oats seeds for the Town of Oak Island and learned the role of vegetation in dune building and stabilization. More than eighty students and teachers from West Stanley High School participated in harvesting sea oats seeds for the Town of Wrightsville Beach and learned the importance of the dune ecosystem. Over 100 attendees at the North Carolina Shore & Beach Preservation Association Annual Meeting learned about seabeach amaranth (Amaranthus pumilus) and it’s role in the dune ecosystem. Following hurricane Isabel, more than 100 residents and elected officials in Dare County learned how to rebuild and stabilize the dune ecosystem using native dune plants. The municipalities of Bald Head Island, Oak Island, and Sunset Beach participated in an aerial dune fertilization project coordinated by this agent. The Town of Emerald Isle received assistance to choose and plant sea oats and other dune species following beach renourishment. The Town of Oak Island Erosion Control Committee received guidance with projects to control erosion along the estuary and on the dunes. 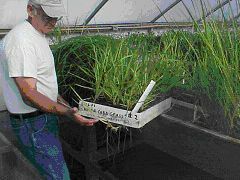 Sea oat research plots were established at the Castle Hayne Research Station to evaluate 58 accessions of sea oats germplasm collected throughout the native range of this species. Fertilization studies were conducted at the Oak Island greenhouse. Field fertilization plots were evaluated on the dunes at Oak Island. 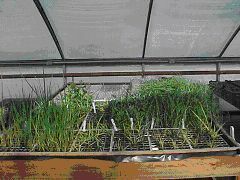 reduction techniques for sea oats, bitter panicum, seashore elder, and seabeach amaranth were improved through research at the Oak Island greenhouse. Research plots at Wrightsville Beach were evaluated and maintained. The Town of Carolina Beach received assistance to produce sea oats and other dune vegetation. The Town of Wrightsville Beach received assistance with volunteer training to plant sea oats on their dunes. The North Carolina Coastal Federation received assistance to grow Spartina alterniflora seedlings for erosion control along estuary shorelines. Working with the NCCF, ninety-seven students and teachers learned to grow and plant estuary plant species. The demand for information and production of dune and estuary plants to control coastal erosion is strong. Tax dollars and tourism revenues are dependent on a healthy dune and estuary ecosystem. Through education and marketing efforts, municipalities and property owners in North Carolina have been made aware of the role of native plants and their availability from North Carolina farmers. These farmers need continuing assistance to develop and improve the production and marketing of dune and estuary plant species.